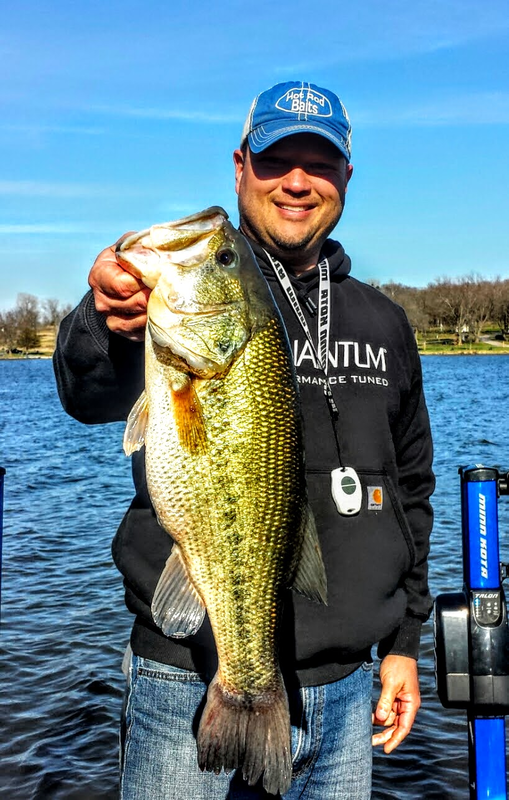 your best bet to catch your largest bass of the year. I think there are several reasons for the phenomena, most likely that the big bass are hungry! No matter the reasons the early fishing season has yielded me my largest bass the past few seasons. This March was no different, I had a chance to fish on Good Friday with my friend Zach Maxfield. We shared a trip early last year that produced Zach catching a fish over six pounds, and this year it was my turn at a heavy fish. We traveled down to Rock Creek Lake, a short 25 minute drive to try to once again hook a March monster. The lake did not disappoint. We fished for about 3 hours, and I had 2 bites. One was chunky 16 inch bass and the other was a March Monster. It weighed in at 5 pounds 12 ounces. The amazing thing about this fish was that it measured right at 21 inches, it was tall and fat! A beautiful fish as you can see from the picture and it is still swimming to be caught again or to lay those thousands of eggs that she will have in another month or so. It was typical spring fishing, throw some slow baits and mix in a jerkbait. Zach threw a jerkbait quite often, but no takers. 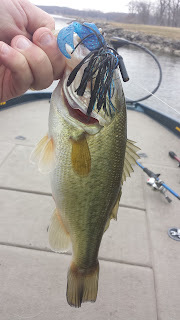 I stayed with the Wig's Jig and plastic trailer from Hot Rod Baits form most of the trip, but the big girl fell for the Bruizer Big Daddy from Hot Rod Baits. This is a large creature bait I rigged up Texas style, it measures almost 8 inches when the tails are swimming behind it. 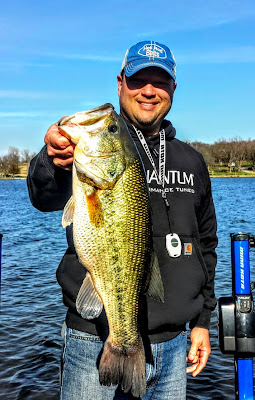 I was using a heavy flippin' rod/reel from Quantum with 15 pound test line. It's big, and that is what big ones want this time of year. Enjoy the spring weather if you can, and remember go big this time of year for that giant! Lake, and this Saturday in the boat throwing jigs and chunks. First bass of the season! The 2015-16 ice fishing season for me has come and gone. March 5th will mark my last day on the ice for the year. Don Henry and I had to make a 2-hour trip north to get on some good ice, but it was well worth it. Clear Lake was our destination, a place where Don had never been to but has been told stories of the possible fish catches if you visit the lake. Clear Lake did not disappoint, and we were greeted with over a foot of nice solid ice in the "big lake". We were able to use my snowmobile to get out and make the day easier for us. We were able to try the Baptist area and Farmers Beach area. Both areas that we tried yielded nice catches of Yellow Bass. As Don soon found out, being mobile and getting your Vexilar down as many holes as possible is key to finding and catching these Yellow Bass. 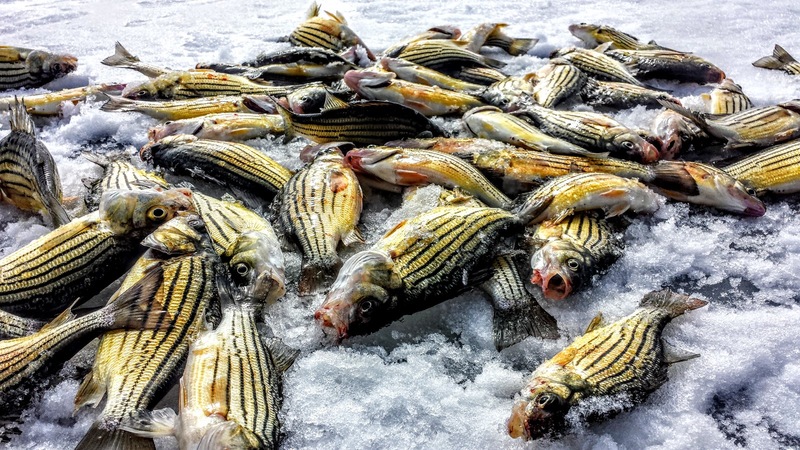 Catching them is rarely a problem, but locating them and moving to keep locating them is the key to any adventure with Yellow Bass. 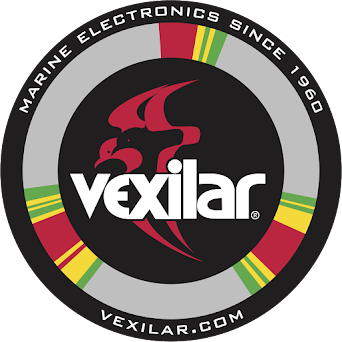 A huge key to both of our successes was using the Vexilar FLX-28 systems. These have a 10 foot mode that allows you to use almost the entire flasher screen to see what is below the ice. We stayed in 7 feet to almost ten feet of water throughout the day. It was a fantastic day of fishing, and we were able to use small spoons all day long to catch fish, a technique I love to do while ice fishing. A five-gallon bucket full of Yellow Bass was our reward for the day and they will taste wonderful in the near future. 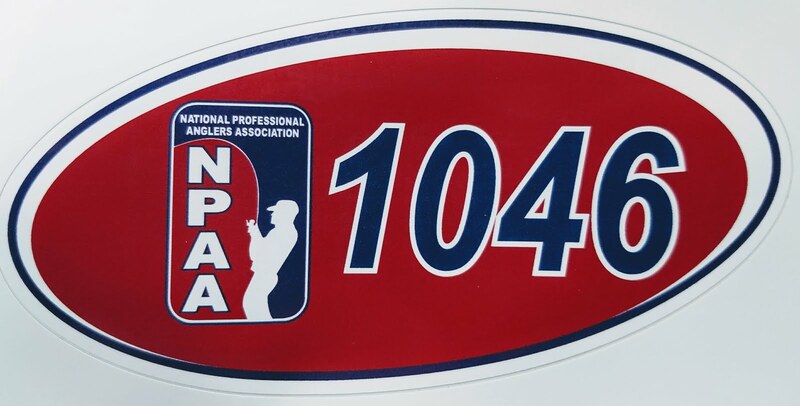 Good bye ice fishing for now...although it was the shortest season for several year, it was still great to get outdoors and enjoy the sport of ice fishing through these cold winter months. I had a chance to film a show for the local cable TV station McTV. If you are a Mediacom subscriber you will be able to watch the show this week. If not, it is also located on YouTube. 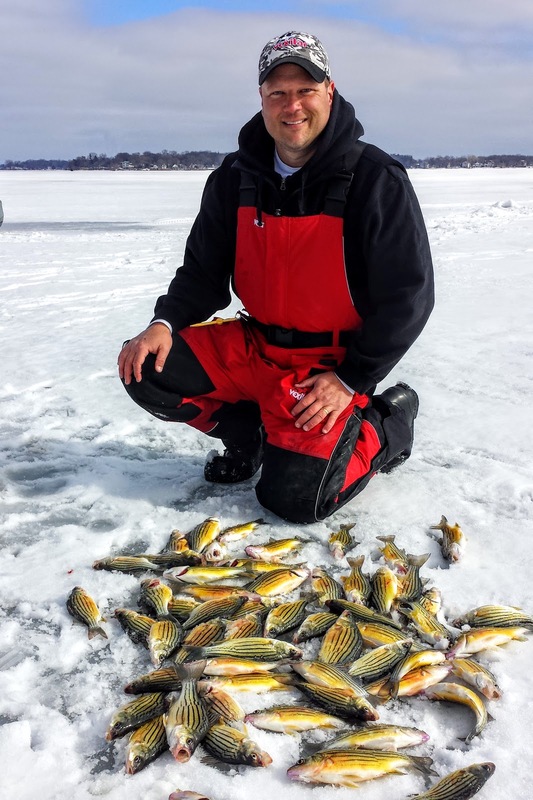 Although the fish didn't cooperate in the short amount of time we had, there a re few tips in locating panfish through the ice and using your Vexilar to find and catch them. I hope you enjoy!